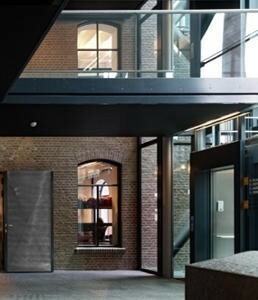 Dutch architects Cepezed designed the extension and renovation of the Textile Museum in Tilburg, Netherlands. The museum is housed in the former Mommers & Co woollen fabric factory, and has recently merged with the Tilburg Regional Archives. The complex is being extended with a new entrance building and an archives storage department with corresponding reading rooms. An abstract glass building has been designed as a new entrance. The transparency of the volume radiates accessibility and enhances the recognisability of the museum and its entrance. The archives storage section consists of an entirely closed concrete volume that is placed like a treasure chest on a steel frame above an existing exhibition building. It has an exterior cladding of PVC-coated polyester fabric. As a component of the revised routing, transparent glass corridors connect the various museum sections.